Are you a photographer looking to upgrade your equipment and step up to the next level? Rather are you a beginner looking to start your quest to be Singapore’s Ansel Adam’s? Seems like Cathay Photo is here for you! Because no matter what’s your level, Charmaine and Ryan of Cathay Photo is here to serve your photography needs! 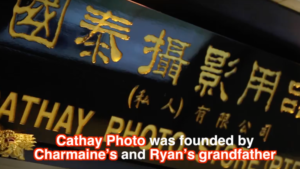 First of all, Cathay Photo was opened by Charmaine and Ryan’s Grandfather 59 years ago, who was a photographer himself. Above all he had a vision and objective of providing high quality photography products and services. As a result he was able to grow his business from a two humble shop counters occupying a quarter of a shop-front to their present four retail outlets, distribution office and warehouse. Certainly they have firmly established themselves as leaders of photographic retail in Singapore! Because they recognised the growing prominence of HD video in the digital imaging market. Rather than sit idly by, they took hold of the opportunity and established themselves in the Professional Video Market! Therefore they now distribute brands like Aladdin Lights, Steadicam, Zacuto and many more. Therefore professional videographers don’t feel left out! Seems like you can join the photographers and get your gear in Cathay Photo! Next articleThe SECRET to Tasty Claypot Rice!